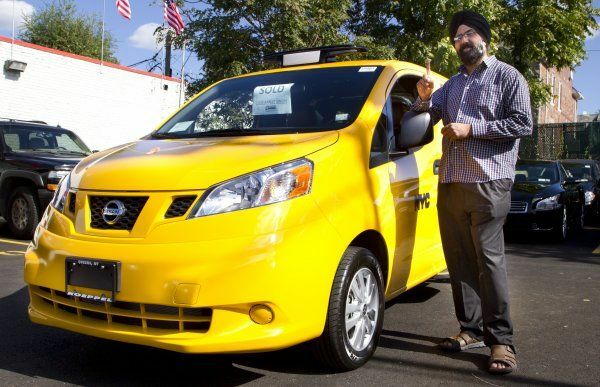 The first Nissan NV200T - also known as the Taxi of Tomorrow - has been sold to a 12-year cab-driving veteran named Ranjit Singh (medallion #7F20) in New York. He purchased the cab through a local dealership and took his first fare in it on October 23 at JFK International Airport before dropping the first fare at 13th Street and 6th Avenue in Manhattan. There are eight dealerships in the New York City area now carrying the NV200T, but they're saying that they cannot keep them on the lot and are having to order them as fast as they can be delivered from the production plant to waiting customers. The custom-designed taxis are a hit with NYC cabbies who had a hand in designing the vehicles for their market. With a combination of safety, passenger comfort, taxi cab-specific ergonomics, excellent driver comfort, and all-around visibility including backup cameras and more, the NV200T is a great fit for cab drivers.